Fiona is an irresistible sweetheart. She loves people, and especially likes to cuddle. She enjoys napping in a spot of sunlight, and sitting in a window where she can watch birds and wildlife. She loves going on stroller rides. 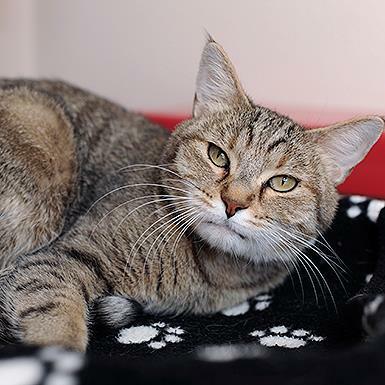 Fiona arrived at Best Friends when an Arizona rescue organization asked for help in treating her stomatitis, which is a chronic and often painful mouth condition. She was treated here, and has not had a flare-up since. It greatly helps if she is in a stress-free environment, and she mostly eats wet food. Born in 2007, she's in fine health otherwise, with just the right blend of energy and quietness. When she's happy, she'll play like a kitten. 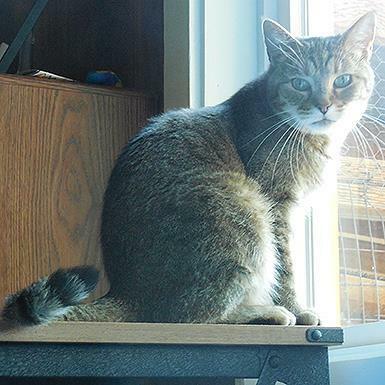 Fiona is not particularly interested in other cats, and dislikes dogs, but is looking to be a loyal companion for an adoring human. 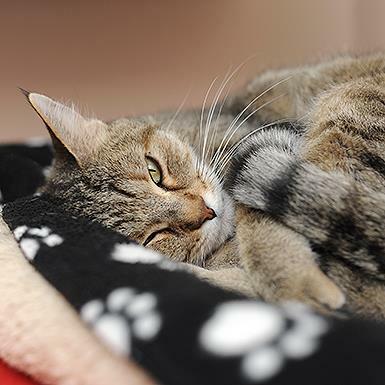 She would love to have a quiet home of her own and someone to cuddle with.